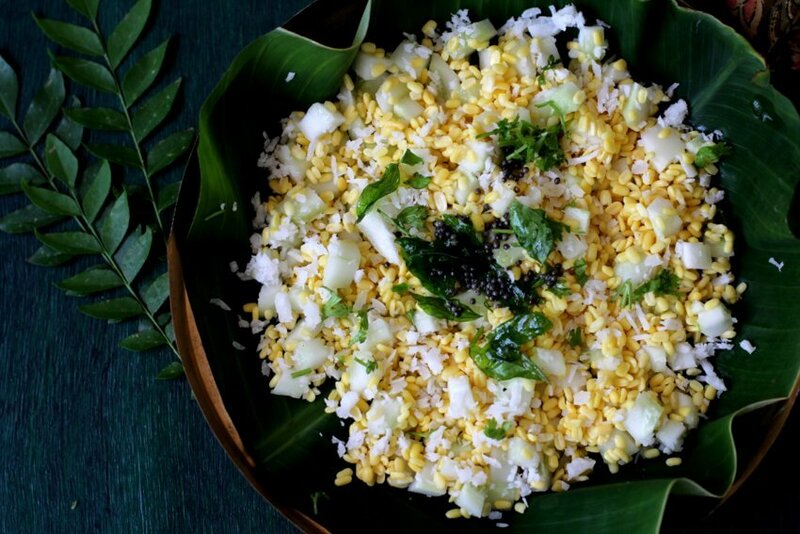 Kosambari is a delicious, protein-packed lentil salad that is an integral part of Kannada cuisine. It is also popular as kosumalli or hesarubele kosambari and is part of every festive meal or wedding feast. In Andhra, it goes by the name vadapappu. On the occasion of Sri Ram Navami festival, we offer neer mor or majjiga and vadapappu panakam as neivedhyam to Lord Rama. It is also prepared during Navrati as fasting food. In Andhra, vadapappu is served along with chalimidi, a rice flour based sweet and offered to Lord Rama. Vadapappu is nothing but soaked moong dal while Kosambari is a salad comprising of soaked moong dal, cucumber, fresh coconut and coriander leaves. Undoubtedly festive, yet simple. 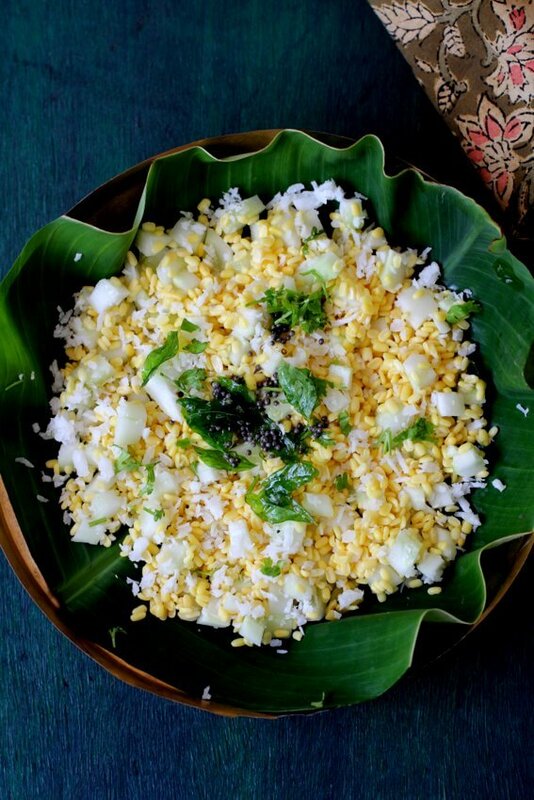 It is a light yet filling salad that can be eaten as a meal by itself along with a glass of neer mor or South Indian buttermilk. It is quick to make and very versatile in terms of the ingredients used. Basic moong dal salad recipe calls for soaked moong dal and cucumber. You can add grated carrot and raw mango too for variation. Soaking of moong dal makes it easily digestible and more nutritious. A perfect protein rich salad for those looking to lose weight. 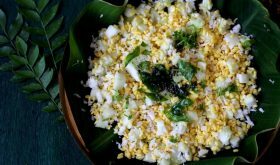 This Karnataka style moong dal salad recipe which is super quick to put together can be tempered with mustard seeds and curry leaves but it tastes equally good without tempering too. It would then fall under ‘cooking with fire Indian recipes’. The crunch from the cucumber, the sweet flavor of coconut and tangy flavor of lemon balances the earthy lentils giving it a delicious flavor and texture. The fresh coriander lends a touch of color and brightness elevating the salad to something special. Less is more, nutritious vegan food that is amazingly tasty. One of the best Indian salad recipes. And I must mention that is stores well in the fridge. Drain the soaked moong dal and place in a colander for a few minutes. Once the water is fully drained, place the moong dal in a large bowl. Add the chopped cucumber, grated coconut, slit green chilis and half of the coriander leaves and mix well. Set aside. Heat oil in a small pan. Once it turns hot, add the mustard seeds and allow to splutter. Add the asafoetida and curry leaves and saute for a few secs. Turn off the heat. Pour this seasoning over the moong dal and mix well. At the time of serving, sprinkle salt and lemon juice and mix well. 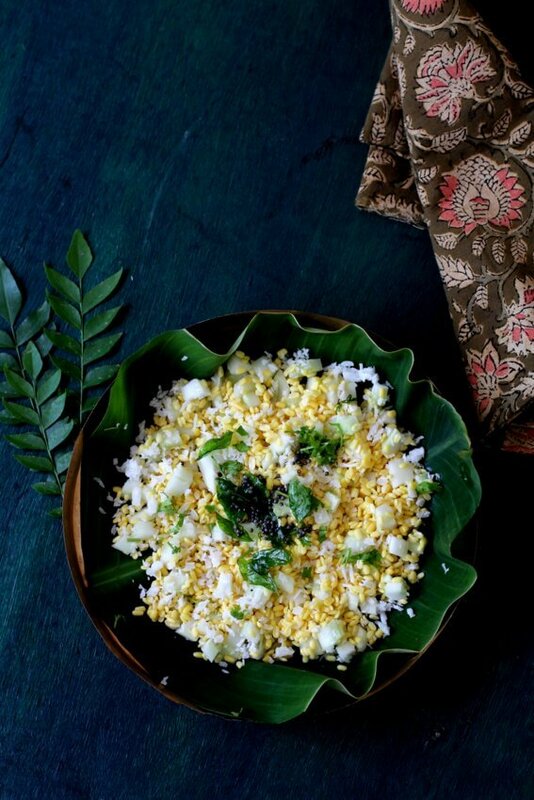 Serve the kosamabari as a salad or as a meal by itself. You can add a grated raw mango or grated carrot for variation. Lemon can be avoided if using raw mango. Add salt only at the time of serving. You can use whole green moong or Bengal gram in place of moong dal for variation. If children are being served the kosambari, do not add finely chopped green chilies. Add one or two slit green chilis and discard them at the time of serving. If serving children, you can add a pinch of sugar. Tempering is optional. You can serve the salad without tempering too. By Sailu Published: April 14, 2016 Kosambari, is a healthy, South Indian moong dal salad made with cucumber, coconut & moong dal to celebrate Sri Rama Navami. Best among Indian salad recipes. It is really good that you are an organic gardener and that is something which is intriguing to me. I do not own an organic garden but I am inclined towards healthy food that is 100% organic. This recipe is fabulous, easy and I am definitely going to try it out soon. Lovely salad this turned out to be! Thanks for sharing such a simple yet wholesome recipe ?